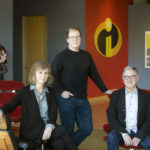 It’s been six years since the last Pixar Short Films Collection release, which is actually a full year longer than Disney waited between the first and second volumes. 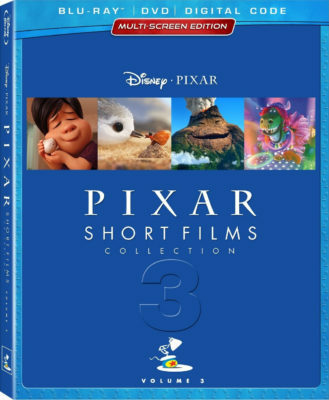 In that tradition comes Pixar Short Films Collection, Volume 3. Completing the collection, along with the release of Cars Toons shorts that aren’t repeated in this collection, can give Pixar films almost every short the studio has created. The previous volumes presented the shorts in chronological order, taking audiences through almost 30-years of Pixar history. Volume 3 upsets the apple cart by presenting the shorts in reverse chronological order, starting with Bao (2018) and ending with Partysaurus Rex (2012). It’s odd that they reverse the short order on the disc when they also spent a lot of time and attention to make sure the entire package is uniform with the previous volumes, from the artwork on all side of the box to the disc art with the old “blue left-side, character right-side” motif that Disney Home Entertainment abandoned years ago. Pixar once again omits a convenient “Play All” option. 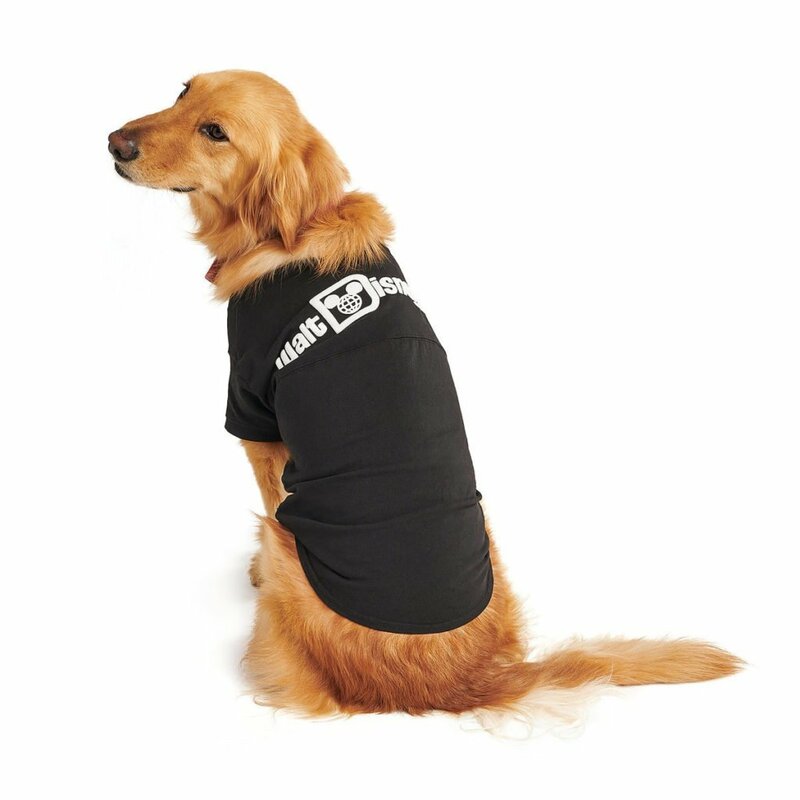 The included DVD uses FastPlay, giving you the option to sit back, relax, and enjoy 76-minutes of Pixar short films with filmmaker introductions in standard definition, but not HD. It’s hard to get past the disappointing presentation that has plagued the entire collection thusfar. If you’ve been collecting all of the Pixar films on Blu-Ray, then you already own nine of the eleven shorts on this disc, as well as the two “Mini-Movies.” The two shorts making their home video debut here are The Radiator Springs 500 ½ and Partysaurus Rex. There was an opportunity to debut an unreleased Cars Toon called To Protect and Serve, which has never been shown outside the studio, but it remains absent from this collection despite being produced during the years covered. Most of the prestige in the set comes from the theatrically released shorts, particularly the original ones. Piper is an Oscar winner, while Sanjay’s Super Team and Lou both received nominations and Bao’s Oscar status will be revealed in a few months. My personal favorite on this set is Lava and the most unique goes to The Blue Umbrella. Most of the movie-inspired shorts pale in comparison, although the two funniest shorts were based on Pixar films, Partysaurus Rex from the world of Toy Story and Party Central, a spin-off of Monsters University. 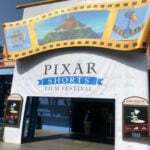 Several of the shorts on this set were produced as bonus features for previous Pixar home video releases, making their inclusion feel a little out of place. 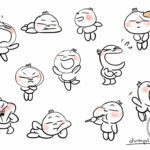 Bao – Director Domee Shi, Producer Becky Neiman-Cobb, and Production Designer Roma Liu. Lou – Director/Writer Dave Mullins, Producer Dana Murray, and Editor Tony Greenberg. Piper – Director/Writer Alan Barillaro and Editor Sarah Reimers. Sanjay’s Super Team – Director/Writer Sanjay Patel and Producer Nicole Grindle. Riley’s First Date? – Director/Writer Josh Cooley and Producer Mark Nielsen. Lava – Director/Writer Jim Murphy and Producer Andrea Warren. The Radiator Springs 500 ½ – Co-Director Scott Morse and Editor Torbin Bullock. Party Central – Director/Writer Kelsey Mann. The Blue Umbrella – Director/Writer Saschka Unseld, Lighting Supervisor Brian Boyd, and Supervising Technical Director Chris Burrows. The Legend of Mor’Du – Director/Writer Brian Larsen and Writer Steve Purcell. 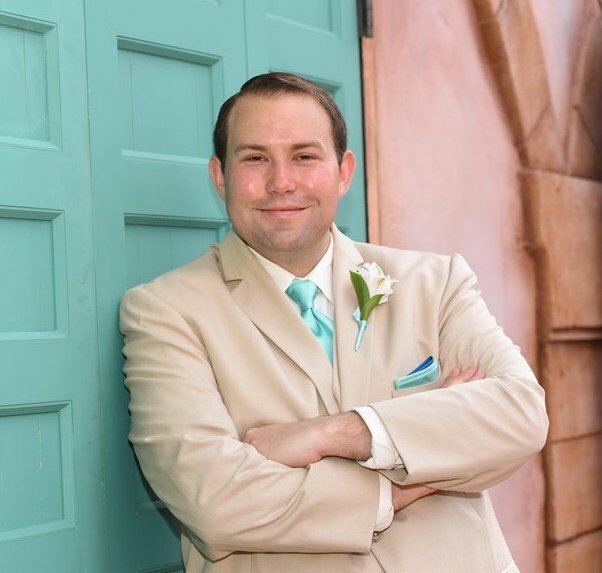 Partysaurus Rex – Driector/Writer Mark Walsh. Marine Life Interviews – Director Ross Haldane Stevenson and Associate Producer Bob Roath. Miss Fritter’s Racing Skool – Dirctor/Writer Jim Murphy and Producer Marc Sonheimer. Making Bao (6:02) – Director Domee Shi reveals the inspirations behind Baoand why this was such a personal filmmaking experience. This bonus feature was also included with Incredibles 2. Caricature: A Horrible Way of Saying “I Love you” (3:52) – The creative team at Pixar discuss their habit of drawing caricatures of each other and how it leads to fun nights at the studio. The 1080p presentation of all thirteen shorts is dazzling. Shorts like Piper and Lava contain photo realistic environments that produce a vast amount of depth. Sanjay’s Super Team has a great deal of dark scenes with inky black backgrounds. The primary audio mix for each short is in 7.1 DTS HD-MA. Each short contains different approaches to sound mixing, but Partysaurus Rex is a perfect example of amazing sound mixing, with sound effects and music traveling around the room as the party gets out of control. Pixar has taken great lengths to replicate the style of the previous two volumes, with matching spines, covers, and backs. The exceptions come from some of the new, Disney-forced esthetics, like the pesky “Multi-Screen Edition” branding on the cover and the Movies Anywhere branding replacing Disney Movie Rewards. The slipcover reproduces the same reflective quality of the previous sets and even the disc art matches. Inserts include a digital copy code through Movies Anywhere and a flier for Disney Movie Club. Both discs open with an ad for Ralph Breaks the Internet. Pressing “Sneak Peeks” from the main menu plays additional ads for Disney Movie Rewards and Disney Now. The main menu features music from The Blue Umbrella as clips from the shorts play, including sound effects only during these bits. 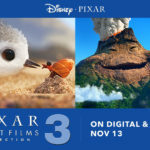 Pixar Short Films Collection, Volume 3 gives fans every theatrical Pixar short released between 2012 and 2018, plus a handful produced as bonus features or web specials. Even if you own some of these shorts, there are two exclusives to this set along with filmmaker introductions and commentaries that can’t be found elsewhere.